Bienvenidos a Mexico! Hidden Trails hosted ride. “Bienvenidos - mi casa es su casa”- this greeting on the main building drew my attention when the friendly driver dropped me off in the early morning at Rancho las Cascadas. This was followed by a cordially welcome by host Uschi, her assistant Jenny and several tail-wagging dogs. After a delicious breakfast, two fellow riders from Europe and I joined a Rancho member on a trip to the Friday market in the neighboring town of Jilotepec. 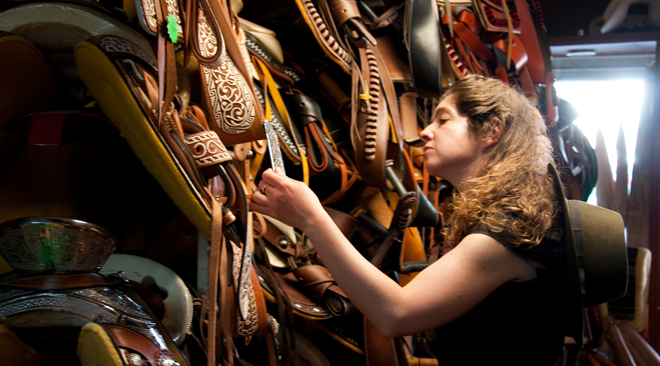 This local market was not only heaven for our taste buds but also the perfect place to find inexpensive sombreros, Mexican style riding boots, leather belts and so on – a Cowgirl’s shopping paradise! Back at the Rancho, we couldn’t wait to go out on our first ride, and it was not only due to our new sombreros that we had big smiles on our faces all day long. Mexico, here we are and ready for adventure! The next day our fellow riders gradually arrived and we were all looking forward to the “Highlands and Explorer Ride” to start. The next morning, after a hearty breakfast, our group of 11 international horseback riders and 3 Mexican wranglers was all set to go – VAMOS! Later, after our first canter, you could hear a “Yippee’ here and “Yeehaw” there and not only the riders seemed to enjoy their first ride but also our four-legged friends. Afterwards, “The Copa” – a waterfall ending in a martini-glass shaped rock, seemed to be a perfect stopover to cool down a bit! Thanks to our team of wranglers, we were able to split up in smaller groups with varying riding pace when necessary. 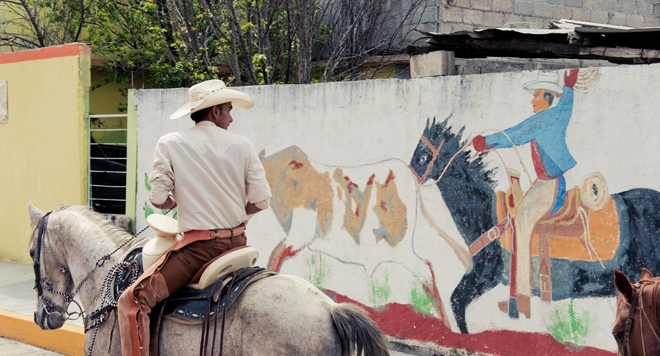 So in our case we split up in a fast, faster and ‘Adolfo’ speed (our fastest wrangler! J). But seriously, with the skill of various wranglers, the Rancho can accommodate any riding level and they will make sure that every participant will enjoy the ride at their preferred riding level. 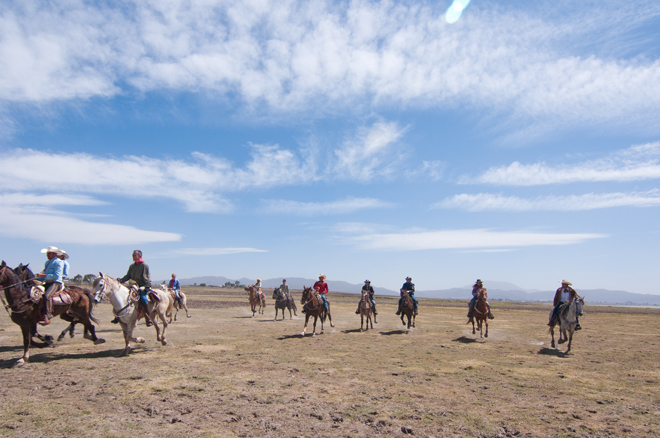 The following days were marked by fast paced riding, diverse landscape and lots of FUN! E.g. our little “photo shoot” along a beautiful lake shore, where every rider (and horse) had a blast, all cantering and galloping smoothly alongside each other! Every new riding day surprised us with varying landscape – from open rangeland, lakeshores, small forests, agricultural landscape and rocky canyons- we had it all! And besides the all the variety, some things seemed to be in endless supply on our rides: sunshine, blue sky, delicious picnic lunches and the stamina of our horses! I guess we, the riders, didn’t perform badly either. Whether it was the daily early morning “Yoga Stretch” session offered by the Rancho, the hearty breakfast, the delicious after-dinner margaritas or a good night sleep in cozy rooms that re-charged our batteries, it worked! One afternoon we even had enough energy for a shopping trip to the tack shops of the neighboring city of Tula. The last day of the progressive ride led us to the so called “Los Organos” (organ pipes), a rock formation in the middle of nowhere. 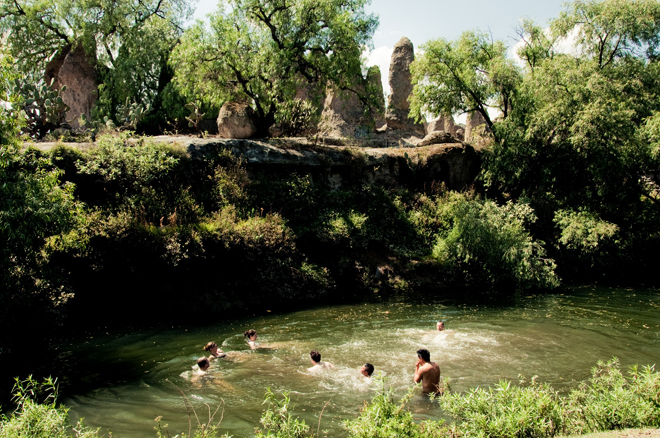 Here we enjoyed a nice picnic lunch and afterwards a refreshing swim in the nearby river. But every journey has an end and to mark the end of this journey we shared a wonderful “Farewell Dinner,” with a live performance by a traditional Mexican band. 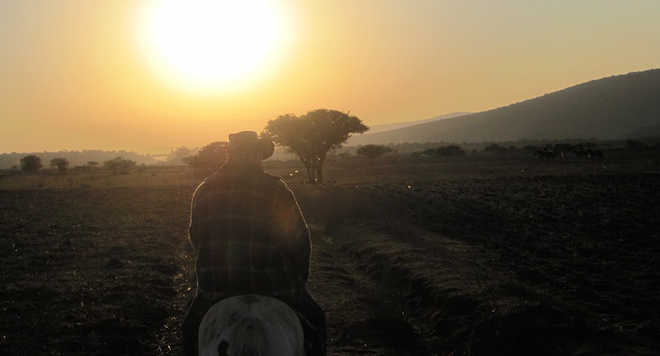 The next day it was time to say goodbye … but not before one last ride! Our host was so kind as to offer a last “treat” to those who were still hungry for more riding – an early morning “Sunrise Ride” before breakfast. This was indeed a perfect way to end this great riding adventure in Mexico! Thanks to Uschi and her staff from Rancho Las Cascadas for all their wonderful hospitality - “mi casa es su casa” is more than just words at the Rancho! A special thank you to all my fellow riders - you made this trip especially unforgettable! Hasta la proxima!